Smart cars like most cars can suffer immobiliser problems, on the early smart cars like the 450 chassis the remote key operates the immobiliser by the button being pressed, the later smart cars the 451 chassis have a transponder (an electronic chip) inside the key. When the smart car immobiliser system is working correctly obviously the car starts and you will be unaware of the immobiliser because unlike most other cars the immobiliser warning light only appears when there is a problem. 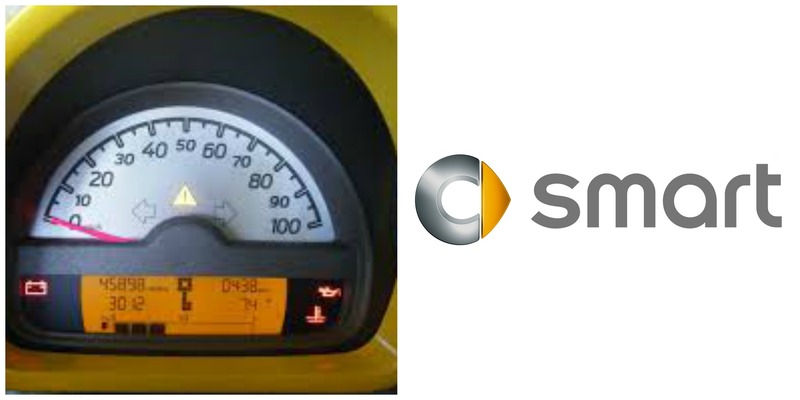 If you have a smart car immobiliser problem there will be a key symbol displayed where the gear selection is normally displayed and the car will not start. Also sometimes when you press the remote key button the indicator lights will flash several times, and possibly on the earlier models the car will not unlock. If you have a smart car with an immobiliser problem the first thing we can do is test both the car and the key, this is important and saves you spending money buying parts that are not faulty. Once we have diagnosed the area that your immobiliser malfunction lays in we can then solve the problem .... sometimes it might require a replacement key, or the car key may need reprogramming, and other it could be a faulty immobiliser unit. What ever the immobiliser problem we will have a solution. What causes immobiliser problems ? There are a number of things that can cause an immobiliser malfunction, damaged or faulty car keys, broken wires in the wiring loom, water ingress into the immobiliser unit, and also things like low or flat car batteries along with jump starting. It is very common with modern day cars that after being jump started there is an immobiliser fault, jump starting can cause a spike of power into the vehicle electronics which can cause damage. if you have an immobiliser fault call us we can help.